The red-polled cow was officially declared as a breed in 1912. During part of the 1930s there were about 30,000 red-polled cows which were found in many parts of mid-Sweden – with a border to the south in parity with the southern part of Bohuslän. In 1938 the organizations for the breeds of red-polled cows and Swedish mountain cows (fjällras) amalgamated under the name of Föreningen för Svensk Kullig Boskap SKB. There were still farmers with foresight who protected the red-polled breeding, keeping it a pure breed. The numbers of red-polled cows had decreased drastically during the 1950s that there was a problem getting bulls. This was solved on a temporary basis by an import of bulls from Finland, the western Finnish red-polled breed. The numbers of red-polled cows had decreased to a disastrous level at the end of the 1970s, with an inventory from 1977 showing only 23 females. Before interest for the breed began its upswing in 1979 there were only 18 females left. A small number of females of the western Finnish red-polled breed were imported during 1981 to strengthen the Swedish breed. These animals were out of the breeding line rather quickly and, thus, didn’t have a large impact on the Swedish red-polled situation. During 1981 a number of females and sperm from three bulls were imported from the western Norwegian red-polled breed. Reparation continued during 1982 when 2 herds of eastern Norwegian red-polled cows were imported. 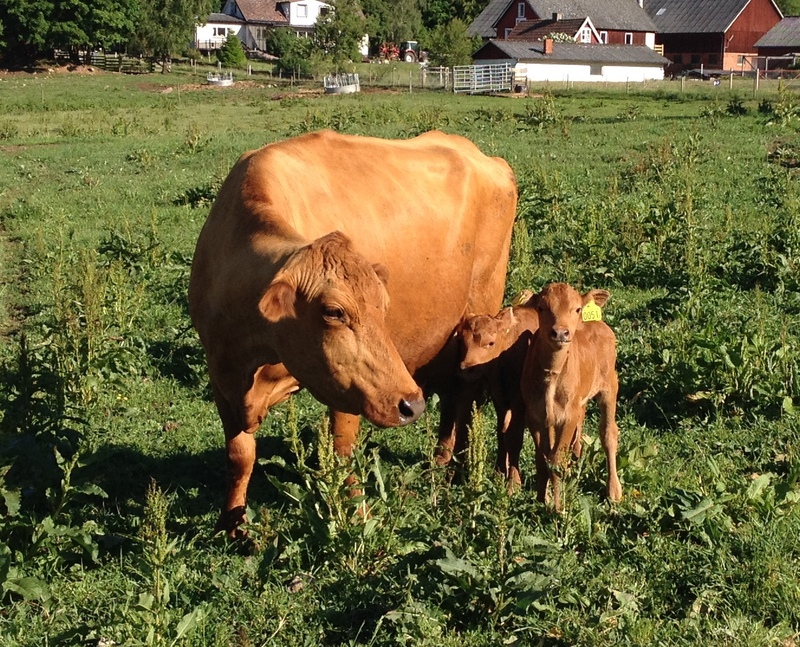 At the end of 2009 the numbers of red-polled cows in Sweden was registered as 1200 pure-bred adult females and 400 bulls as well as sperm in a gene bank from about 70 bulls. 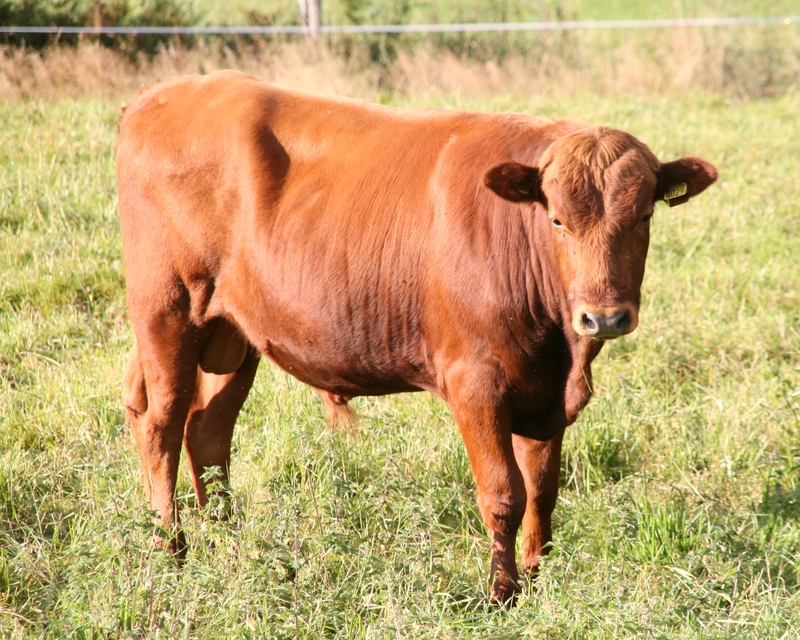 The final acknowledgement that the red-polled cow is a breed came in 2004 when the Agricultural Department assigned a special breed code for the red-polled cow. The red-polled is a hornless breed – a combination of milk and meat breeds. Only small horn bumps can be seen. The colour is red, in all its nuances. With full red often the most common, there can be white marks on the animals…a star, socks, white head (so-called hjälmighet) as well as spotted animals. The red-polled is durable and has a lively temperament, a good humour, strong legs and hooves, good fertility, easy calving, good motherly characteristics and free from inherited defects. kg. Live weight of a cow is between 350 – 600 kg and milk produktion, in a good year, will be acout 5,500 kg per year. It is best adapted in a production with a high percentage of coarse feed. The red-polled bulls have a very good growth rate and this makes them adapted from both extensive and intensive meat production. Slaughter weight at 30 months of age will be between 250 and 400 kr. Red-polled animals are very good pasture animals. They withstand the cold and can, therefore, be kept outdoors year-round, if other conditions also allow it.